I saw your video on the 6 1/24 cars on the latest layout. They go around pretty well. Do you have the magnets on them? How is the power supply copying with having 6 cars at one time? From the video all looked pretty smooth. And I like your latest layout. Yes, we use the center magnets with the 1/24 cars. We are using an adjustable power supply, and it seemed to handle the six cars just fine. Thanks for the comment about the layout. We are actually going back to the original layout for a while. I just finished putting it back together tonight! Sorry for taking so long to reply to this, but the table is 25" tall. I really like a shorter table, because as you mentioned, it is much easier reaching cars in the middle of the table. Also, it makes it easier to climb up and down on when I am creating a new layout. Thanks for answering this. 25" seems to be a very good height when I generally "guestimate" what could possibly be best vs. standard 30" height of tables. Go any lower mind you, and you might just ask yourself what the difference is playing on the table vs. the floor! 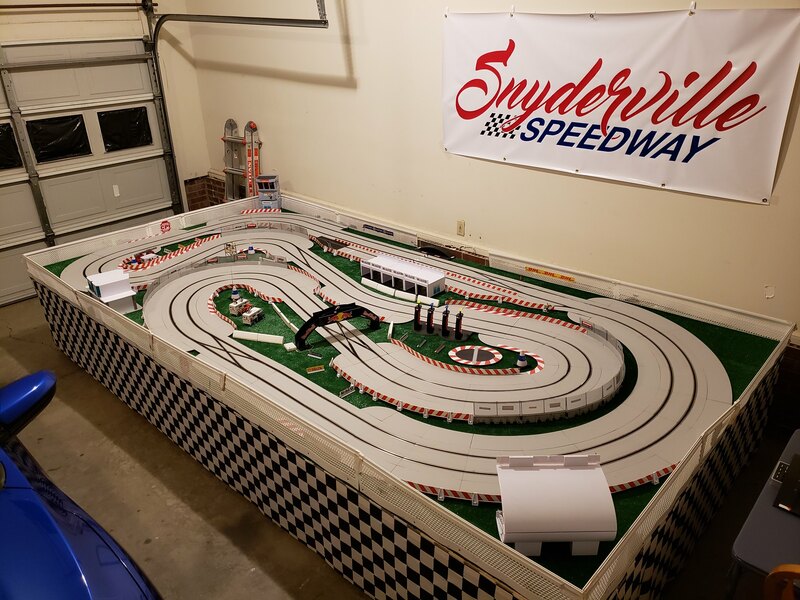 Racing is back at Snyderville Speedway and with a new layout! Alright guys, I have posted three new videos on my YouTube channel. This is the start of a new series of videos where I will be commentating the races. I've always had a ton of interest in commentating, and now I have the opportunity to give it a shot and get some great practice. I'm brand new to this, so please feel free to give me feedback on the commentating or the videos in general. I would love to here any suggestions as well as positive criticism. Thanks in advance, and I hope you guys enjoy the videos! Last edited by Josh S; 11-03-2018, 08:23 PM. This is an older video, but I just recently found it. It was a short race, but nevertheless, there were no crashes! Last edited by Josh S; 11-13-2018, 05:33 PM. Just watched the three from above- some really good racing going on! Enjoyed watching racers take 2-3 laps to complete a pass on the outside, move to the inside, and then pull away in the following laps. It really resembled 1:1 racing. Commentary was great. This place is nearly dead, or I bet you would be receiving more comments on these. Last edited by b.yingling; 11-08-2018, 02:05 PM. OK Josh, here's my feedback on the commentating: Will you please replace Cris Collinsworth on Sunday Night Football? Thank for the feedback, Bruce! That is one thing I really like about the flat layout with digital racing. There is a preferred driving line just as 1:1 racing. So you really have to work hard to make a pass on the outside. I think it makes for some fun racing. That is really funny. Thank you, sir! Last edited by Josh S; 11-10-2018, 07:20 AM. Race two of the short five race series. I enjoyed watching it. Given the inside lane is preferred, have you ever considered requiring any single car deslots to reslot on the outside lane and have to commit 1 full lap in that lane before changing inside again?